Can you tell us a little bit about your personal background and how you got into the septic industry? Tell me how you were trained as well. My family started way back in 1954 with my great grandfather in the septic industry. So, that makes me the fourth generation of my family to do this kind of work. To tell you a little bit about my background, I went into the United States Army at age 17 and then spent two and half years in Iraq. When I got back my grandfather said “Why don’t you start your own company up North?” I was a natural fit, having grown up in the industry. That was about ten years ago in 2007. Now, I have a six-year-old little boy, Daniel, who “works” on the truck riding along with me a lot of the time. He already acts like the little boss man! What does your business structure look like in terms of how many people work at your company? We have two and a half people working, including myself. My little boy is the half! It’s just mainly me running the trucks with one other person who does that as well. My fiance just started taking over the administrative duties, which I used to exclusively do for the business, but she’s tackling all the paperwork now. Before that I was doing it alone for 10 years. What kind of research have you done to help you make smart choices about what kind of equipment you use, and can you outline some of that for us? I have about eight trucks that I run all by myself. Some of those include a Kenmore triangle 4500 gallon septic truck, an International 2300 gallon truck, a Peterbilt tractor-trailer with a 7000 backing trailer, and a Kenmore 6500 vacuum trailer, and an International dump truck, a Dodge service truck, and I do excavation too, so I have one of those that I also do work with. Can you breakdown the productivity of your company, as far as the service you mostly offer to your customers? We mostly do pumping and repair work, sewer line cleaning, and that encompasses camera work as well, to snake into the pipe systems to get to the root cause of the issues people are having with their lines. What are some of the features and services of your company that make you a vital part of your industry? 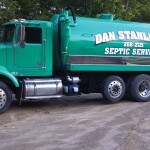 Why would someone choose you over other options in the septic industry? Well for one thing, we don’t cut corners, we offer a good price on all of our services, and I’m on every job, so I make sure everything is done right and I’m always on the lookout for repeat customers. That’s basically how I make sure our business stands out from the rest of them in my area. What are your challenges that you’ve faced along the way after 10 years in the industry running your own company? Every step of the way is a challenge! When I first started out, I had just enough money to buy an old International truck that was tough to keep running right all the time. I was living on granola bars for three full years, and Ramen noodles just to get by with building the business and expenses. The trucks would break down over time, but luckily we’ve overcome all that for the most part. The early days were the toughest though, but everything is much better now. Even though you are basically the entire operation, how do you boost morale in your other worker? Most of the time, we try to give out extra bonuses if we have a really good year. Family time is a huge thing with us, so we make sure to be understanding about that. That seems to help with morale overall. Tell me about your client base and the breakdown of the work you do between commercial and residential? We have quite a bit of commercial accounts, although I would say that 75 percent of the work that we do is residential. It’s harder working with private citizens as opposed to commercial operations to say the least! What problems do you confront on a daily basis in your septic industry and how do you handle them to keep the business running smoothly? Disposal sites are so difficult to come by. I wish there were more of those. As it stands, each site where we dump the waste just isn’t close by in any stretch of the imagination. For our city in Maine, the disposal site where we dump is about 50 miles away. It’s always an issue on an everyday basis to deal with. We just deal with it.